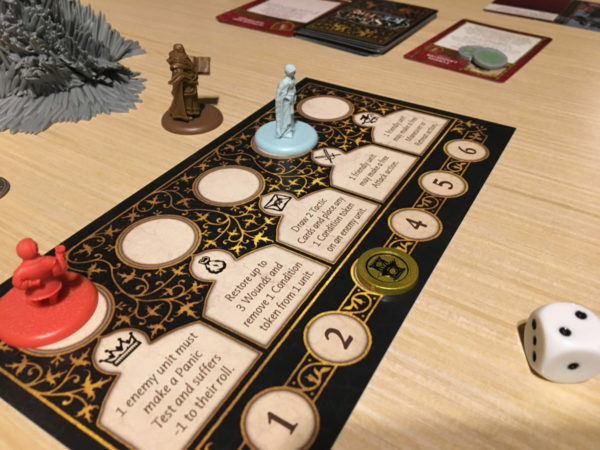 So after our first game of A Song of Ice & Fire Miniatures Game, I’ve had some time to collect my thoughts. As a quick recap, we played a 30 point “small” game using only the starter set. 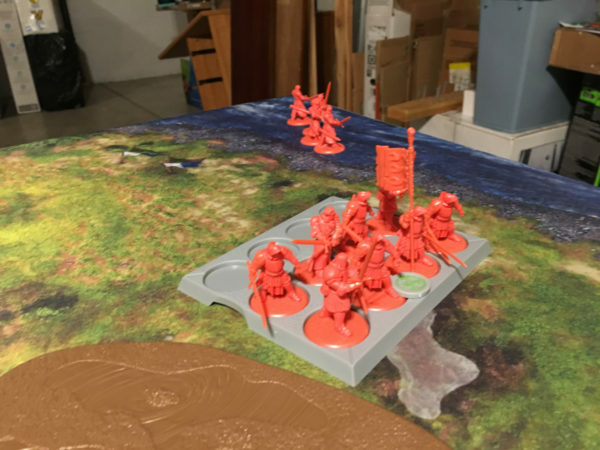 The army lists were netdecked from the Kickstarter updates that featured some initial build lists. I played the Starks under Greatjon Umber and my friend played the Lannisters under Jaimie. The game was quick, ending after the 3rd round after securing 8 VP (the victory condition for the game scenario at this army point value). It was also quick in that it clocked in at about 90 minutes after setup and rules explanations. This may seem long but my friend and I play notoriously long games as we talk strategy (or tangent off to whatever) and contemplate our moves. For us, 90 minutes was a nice surprise as our Dropzone games with just the starter struggle to wrap up in under two hours. 300 point Star Wars: Armada games rarely end after two hours and all these games have a max turn size of 6 total rounds. For a first outing with card reading, rules referencing, and more, 90 minutes has a lot of potential when adding just 10-20 more army points to get to the standard or large army sizes. Even though the game was faster than anticipated, it did not seem simplistic. I’ve played only two other “rank and file” war games so I’m no expert of the genre but the game forced some hard decisions and allowed for the chance to make some devastating tactical errors. Overall, there is definitely enough “meat” in the game to have us coming back. There were several moments where I know my opponent was thinking “if only I…” and it could have maybe flipped the game results entirely. So all-in-all, we were both pleased with the game and relieved that we didn’t blow a bunch of money on a crappy minis game. We both want to play through the game more and explore the options in more detail. With the general thoughts out of the way, I’d like to jump into the actual gameplay elements themselves. The only issue I have with the game as is, is that the rules for terrain and how to interact with them are pretty sloppy and haphazard. Maybe CMON thought it was ok for a casual player to pick up and house rule with their friends but they want the game to be a tournament level game and dedicating maybe 150 words to describe eleven different keywords isn’t going to cut it. Hopefully CMON releases an FAQ or a tournament rules supplement that spells out the terrain keywords clearly and consistently. It is by no means a deal breaker but the rule book is pretty well done in almost every other aspect and for it to fail there seems odd and out of place. We dealt with it by discussing how to handle the terrain features and the spartan rules provided and moved on. Aside from the terrain, I didn’t have any other issues with the design and rules. I think the game design expects a lot of inconsistent abstraction and leans heavily on the players to fill in the sometimes awkward narrative gaps but mechanically, the game is sound. It does require you to not take the game very seriously as sometimes the absurd mechanical effects require some silly narrative instructions. At one point in the opening, Sansa triggered the Crown command on the Tactics board and sent a whole rank of the Mountain’s Men panicking. Later, Tyrion triggered the Wealth command and bought them back. Narratively, maybe the designers are taking cues from the HBO Game of Thrones series that will see faster-than-missile raven letters flying back and forth from one side of the continent to the other and that is how this unit got the notice from dear Joffrey that he was going to have their balls on spikes soon only to receive a note from Tyrion later saying Joffrey was kidding and here’s some “fun money” for after the battle. All of this is awkwardly described in the rules as “wounds,” both taking and gaining back. Wounds sound fine if figures had wound amounts that they absorbed like the cavalry or monsters but units gaining them back and forth by gaining and losing figures is odd. The only solace I can provide is that the game is mechanically fun, the minis are well sculpted, and there is quite of bit of appropriate theme involved. Just roll your eyes or laugh at some of the awkward design points and have fun. Two aspects of the game that make it unique among the Rank and File genre are the Tactics Deck and the Tactics Board. I think I like the Tactics Board better as it is a tangible strategy point both in army building and gameplay execution. The ability to gain extra actions or effects through the use of NCU (non-combat units) is particularly fun. 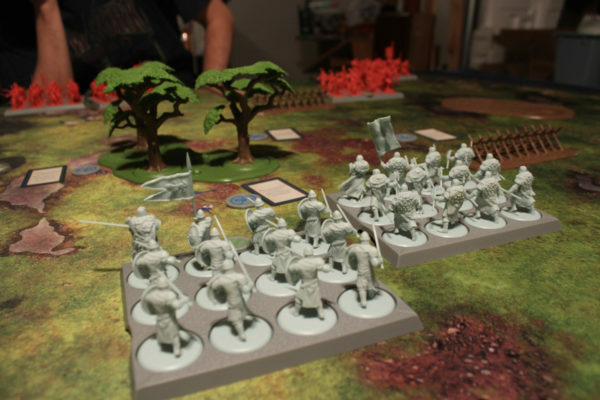 It offers a nice choice balance of activating direct conflict through the units on the board, or subtle and not-so-subtle effects to enhance the board state. Knowing when to jump on that board with your NCU is a pretty critical strategy evolution that I can see gamers taking time to develop. Tactics Deck are similar in that they enhance the game play but usually are not direct features. I say this with limited experience as this was the aspect of the game we explored the least. I played two cards all game and my opponent played maybe 4. We never discarded cards or drew up more as we hardly played them. This was likely because we didn’t really know what was in the deck so even though we both had cards that weren’t useful at the moment, we weren’t sure if we would discard them only pull even worse cards later. Unlike Warhammer Underworlds: Shadespire, the Tactics Deck cards seemed narrowly focused and trying to get their triggers to activate didn’t always correspond to what I needed to do to win the game. I actually like this for the grander wargame setup of ASOIF. I have a lot of fun with Shadespire but a lot of the time it feels like you are just trying to fulfill the card trigger requirements more than brutally attack your opponent. That game is quick and light so it works well. ASOIF is not or maybe should not so I’m glad that your strategy is dictated by more than what cards you drew. That being said, we played cards-lite and focused more on the battle at hand. Things may change as we learn the Tactics Deck more and make more efficient use of our cards. Regarding the units themselves, all-in-all they were fine but I was pretty disappointed with the native Stark Fury ability. Every time I used it, it seemed to gain me very little in the way of offensive power and punished me on the risk side. The biggest moment was when I used Greatjon’s commander order in combination with my Sworn Swords Stark Fury ability only to gain 2 extra hits (one bonus from the ability itself and one from the single six I rolled). The resulting vulnerable and panicked condition I put on the enemy only gained 2 extra wounds from what I what have gotten without using the ability. At the conclusion of the attack, I then had to suffer the risk side of the effects and roll 2d3s and take that many wounds. I maxed both rolls and lost 6 figures total. One can argue that the example was taken from poor rolls on my side versus decent rolls on the other but every time I had to roll a d3 for using a similar ability, it was always taking the maximum damage and giving very little in return. I want to like the Stark side for thematic reasons but in looking at the abilities my opponent had, I think I might prefer the Lannister side more. It’ll take a few more plays to really see but I look forward to trying and how much deeper the game goes.